Orchid Show 2018 at the Missouri Botanical Garden in the Orthwein Floral Display Hall in the Ridgway Visitor Center. Admission is an additional $5 to the regular Garden admission. Free of charge for Garden Members. See website for more information. 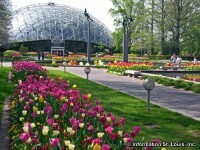 The Missouri Botanical Garden is located in the Shaw Neighborhood of St. Louis Missouri, and adjacent to Tower Grove Park. The Garden hosts many special events throughout the year, such as the Japanese Festival, the holiday Garden Glow, the Whitaker Music Festival, and many plant shows and art exhibits. Directions: Located on Shaw Blvd, between Tower Grove Avenue and Alfred Avenue. Take Interstate 44 to the Vandeventer exit and go east on Shaw Avenue, or to the Grand Blvd exit and go west on Shaw Avenue.